NCTE Integrated B.Ed Course 4 Years Integrated Teacher Education Programme | NCTE B.Ed Course with Intermediate Qualification | NCTE 4 Years Integrated Teacher Education Programme (ITEP) 2019 (Integrated B.Ed Course). 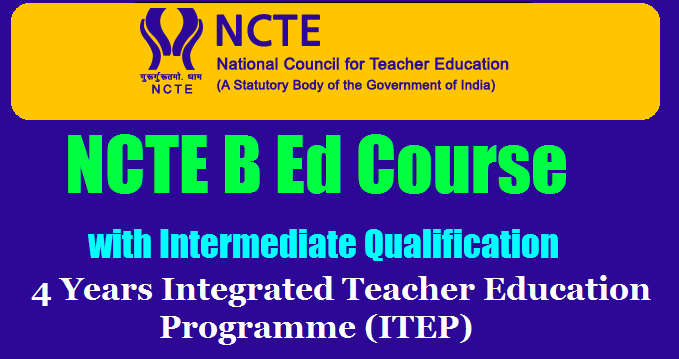 Integrated B.Ed Course to be started for 2019-2023. NCTE 4 Years Integrated BEd Course Qualifications, How to apply and Application dates schedule, fee details given here. NCTE has launched the 4 Years Integrated Teacher Education Programme (ITEP) 2019 and applications are invited from the eligible and interested COMPOSITE instituitions for start of ITEP Course i.e for grant of recognition /permission to 4 Years Integrated Teacher Education Programme (ITEP) for the academic session 2019-2023 (4 years Degree with Teacher Training Programme). NCTE invites online applications from COMPOSITE institutions from 03.12.2018 to 31.12.2018 for grant of recognition/permission to 4 Years Integrated Teacher Education Programme (ITEP) for the academic session 2019-2023. The details are available on NCTE website: www.ncte-india.org. It may be noted that only those institutions which are "composite institutions", as defined in clause 2 (b) of Regulation 2014, (reproduced below) on the date of making the application shall be eligible for this programme: " (b) 'composite institution" means a duly recognized higher education institution offering undergraduate or postgraduate programmes of study in the field of liberal arts or humanities or social sciences or sciences or commerce or mathematics , as the case may be. at the time of applying for recognition of teacher education programmes, or an institution offering multiple teacher education programmes." 5. The applicant institutions which do not qualify as per clause 2 (b) of NCTE Regulation, 2014 (Supra), shall be treated as ineligible and their applications are liable to be rejected and processing fees paid by them may be forfeited. 6. In case of any clarification, the applicant institutions may get in touch with NCTE officials on the following mobile Nos. during office hours (9.30 am to 5.30 pm Monday to Friday).